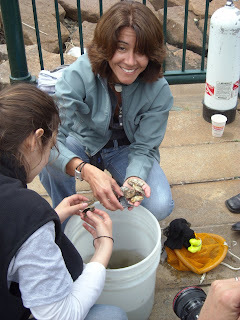 Many of you may recall meeting a smart, active lady at our oyster placement events. She is Anamarija Frankic, an Assistant Professor in the Department of Environmental, Earth, and Ocean Sciences at UMass Boston. She and her department have been very helpful to MOP as we try to figure out the myriad of questions associated with a groundbreaking restoration effort. EPA New England recently announced the selection of University of Massachusetts Boston for its Urban Waters/Mystic River UniversityCollaborative. The EPA is developing collaborative relationships in support of its urban waters/Mystic River Watershed Initiative, beach and nonpoint source programs. Given Anamarija's intimacy with the harbor and the Mystic River this looks like a great selection.